Gray again – this time a little lighter shade and not a cardigan. I wanted a pullover with wrapped effect and I didn’t want to reinvent the wheel. So I used my TNT knitting pattern – Jewel by Kim Hargreaves – altering it yet again for the faux wrap in the front. Finished, the sweater looked like it could use a little pep. I dug through the button and ribbon stash, and in a nod to my romantic side, I sewed on a bit of black lace so that it’s just peeking out from behind the front edges. The large black button anchors the waistband overlap. 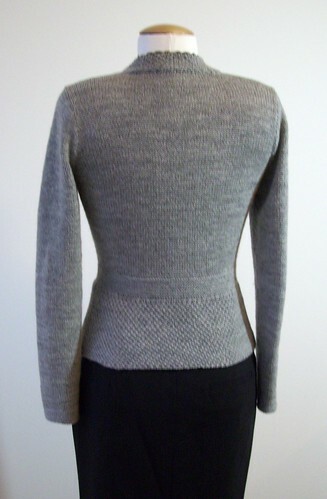 I knitted the peplum flat until the garter stitch waistband was finished, then joined the work and continued in the round until the bottom of the V-neckline, then flat again. The yarn is my favorite sport-weight: Nature Spun by Brown Sheep, in Grey Heather. I am quite happy with how this sweater turned out. It was a quick knit with minimal math, and the fit is perfect. Love, love, love this! Your knits are very inspiring. As usual, absolutely beautiful – love the lace and button details. Gorgeous. Thanks so much for sharing it with us. This is stunning! I sure wish I knew how to knit.